It’s being called a more “responsible” use of federal dollars for commemorative portraits of government officials. At least, that’s the name of the bill. Turns out, the much-ballyhooed ban on taxpayer-funded portraits of the president and other public officials that passed earlier this year was not permanent. The omnibus fiscal 2014 spending bill did deny funds for commemorative portraits—but just for the fiscal year. On Wednesday, however, the Senate Homeland Security and Governmental Affairs Committee is set to consider legislation to completely stop the practice. Well, for most portraits, anyway. The Bipartisan Responsible Use of Taxpayer Dollars for Portraits Act, pushed by Sens. Jeanne Shaheen, D-N.H., and Tom Coburn, R-Okla., would permanently cap the amount of taxpayer expenditures for such portraits at $20,000. And the bill would limit even that amount to portraits of people in the official line of succession to the presidency, such as the vice president, House speaker, president pro tem of the Senate, secretary of State, and other top officials in executive departments. “There’s no reason to continue excessive taxpayer spending on oil paintings of government officials,” Shaheen said Monday in a statement. Most members of Congress and other executive-branch agency heads would not qualify. The bill would not, however, ban the use of nonfederal funds to help pay for the paintings if the costs exceed $20,000. 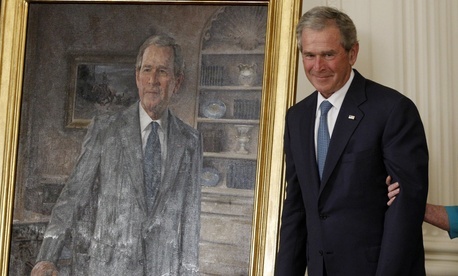 Controversy over use of taxpayer dollars for commemorative portraits has existed for years. But amid deficits and spending cuts, the issue has gained more attention. For instance, a review by The Washington Times found that the federal government spent $180,000 on official portraits in 2012. The Environmental Protection Agency spent nearly $40,000 on a portrait of then-Administrator Lisa Jackson; the Air Force spent $41,200 on a portrait of then-Secretary Michael Donley; and the Agriculture Department spent $22,500 on a portrait of Secretary Tom Vilsack, according to The Times. “We should pay for these types of portraits in a way that protects taxpayers instead of wasting their money,” Shaheen said.